People hate change. We may sit around and wish our lives were different, but when the rubber really starts streaking the tarmac, we usually find ourselves wishing we could just hang out here in our safe and familiar haunts. A good way to conceive of movie stories, like Die Hard and Love, Actually, is to think of the visible story as the metaphor for the invisible story. In other words, the plot is all about the character’s inner journey, whether the connection is immediately evident or not. Plot, in its simplest manifestation, is all about the protagonist’s thwarted goal. He wants something, and he can’t have it right away, so he keeps right on trying. One of the most common mistakes made by authors of every level of experience is to create a problem for their Main Character that has nothing to do with the story at large. The reasoning behind this is not to separate the two, but usually occurs because an author works out a story and then realizes that he has not made it personal enough. The Change Arc is all about the Lie Your Character Believes. His life may be horrible, or his life may seem pretty great. But, festering under the surface, is the Lie. In order for your character to evolve in a positive way, he has to start out with something lacking in his life, some reason that makes the change necessary. He is incomplete in some way, but not because he is lacking something external. A person in a prison camp can still be entirely whole and balanced on the inside, while someone floating in a Malibu mansion’s swimming pool may be one miserable son of a gun. Nope, your character is incomplete on the inside. He is harboring some deeply held misconception about either himself, the world, or, probably, both. As we’ll see in next week’s post, this misconception is going to prove a direct obstacle to his ability to fulfill his plot goal. In some instances, it may start out seeming to be a strength, but as the story progresses, it will become your character’s Achilles heel. Your character may not even realize he has a problem. In the First Act, his understanding of his deficiencies will be vague at best. He may not feel handicapped or even in denial about the Lie, until the Inciting Event and/or the First Plot Point (at the 25% mark) rock his world and begin peeling away his defenses. The First Act gives writers the time and space to introduce the Lie and demonstrate the character’s entrenchment in it via his Normal World(which we’ll also address more in a future post). The Lie is a specific belief, which you should be able to state in one short sentence. It may include some qualifiers, as does Jane Eyre’s. Her basic Lie is that she isn’t worthy to be loved, but it’s qualified by her additional belief that she can earn love if she is willing to enslave herself to others, physically and emotionally. None of these are the Lie, but they’re often products of the Lie. Your protagonist may be aware of the symptoms of the Lie in his life, even if he isn’t yet able to recognize the Lie itself. More than that, he may be totally willing to shed the negative symptom, but he can’t because he can’t get past his fundamental belief in the Lie. For example, in my historical novel Behold the Dawn, the protagonist Marcus Annan’s Lie is that some sins are too great to be forgiven. His symptoms are guilt, shame, secrets, and a destructive lifestyle. He wants to be forgiven and to find happiness and fulfillment, but he just can’t get past the Lie. Angela Ackerman and Becca Puglisi do a great job of of offering possible Lie symptoms (as well as some great character arc discussions) in their book The Negative Trait Thesaurus. If you find you’re having trouble coming up with some good symptoms (or even a good Lie, for that matter), take a riffle through their book for some inspiration. A Christmas Carol by Charles Dickens: Ebenezer Scrooge’s infamous holiday transformation is rooted in his mistaken belief that a man’s worth can only be measured by the amount of money he has earned. Cars directed by John Lasseter: My favorite of all the Pixar movies is powered by selfish racecar Lightning McQueen’s ingrained belief in the Lie that life is a one-man show. 1. What misconception does your protagonist have about himself or the world? 2. What is he lacking mentally, emotionally, or spiritually, as a result? 3. How is the interior Lie reflected in the character’s exterior world? 4. Is the Lie making his life miserable when the story opens? If so, how? 5. If not, will the Inciting Event and/or the First Plot Point begin to make him uncomfortable as a result of his Lie? 6. 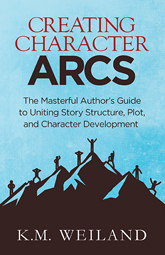 Does your character’s Lie require any qualifiers to narrow its focus? 7. What are the symptoms of your character’s Lie? The Lie Your Character Believes is the foundation for his character arc. This is what’s wrong in his world. Once you know what’s wrong, you then get to set about figuring out how to make it right.